A labelography page was added to the website today. 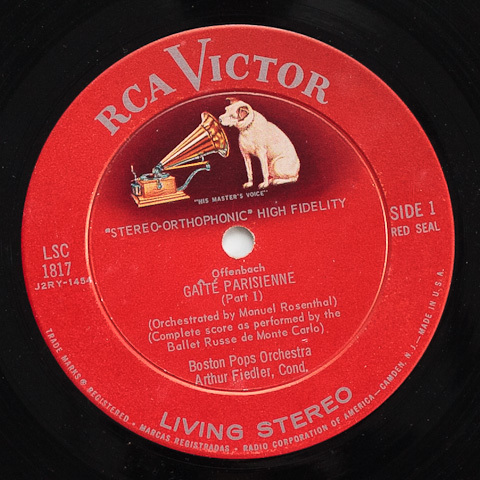 It includes all the major label variations for RCA Living Stereo classical records pressed in the United States, from their first release in 1958 until the late ’60s. Dates are approximate and were sourced from Ron Penndorf’s excellent RCA Victor Red Seal Labelography. By the way, there is a comments area at the bottom of the new labelography page. If you have any questions or corrections, please let us know. On the PSD and SD mono labels with the “Long 33-1/3 Play”, this was a generic terminology for “LP” which Columbia came up when they mastered the development and production of the Long Playing record in 1948. They also came up with the “LP” logo, secured it as a trademark and added it to their “Columbia” trademark. Thus, all other manufacturers had to come up with their own generic form of Long Play logos.